$100,000 in CD Poker's Jackpot sit 'N' go. Excellent software with crisp graphics. Lots of promotions and tournaments. Great hand history with graphical cards. Balance available in the lobby. Growing room, but needs more players. Lobby lacks categories by limits. 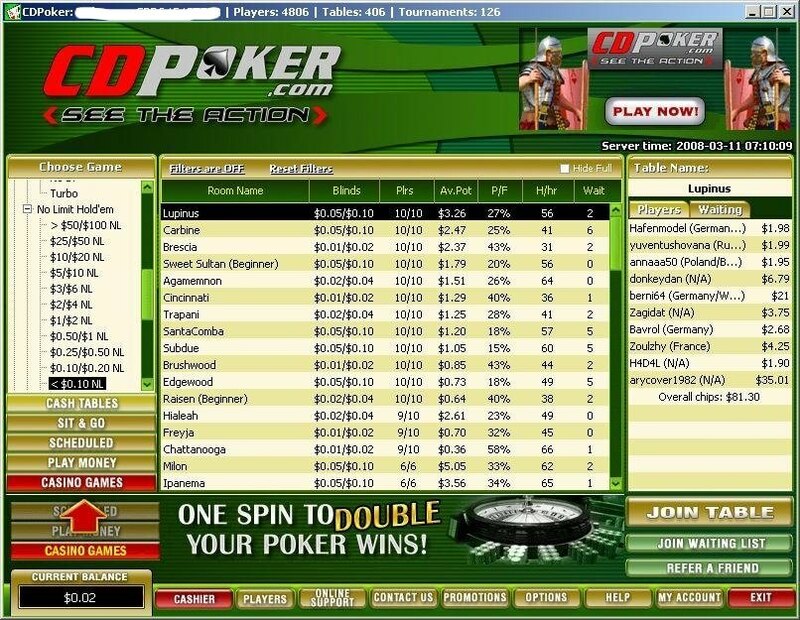 CD Poker is a good online poker room which stands out particularly in terms of software and promotions. The EveryPoker.com staff enjoys the poker client so much that we believe it is the best-looking software on the internet. It’s clean, fast and simple to understand. As for promotions, there are countless Jackpot games and a quite good sign up bonus. The traffic is not very high but enough to bring some action to the tables. If you are looking for soft competition, you will find that it is quite easy to build up a bankroll here, but you will definitely meet more competition at higher stakes. It is worth mentioning that only Texas Hold’em and Omaha is supported, but in a variety of game modes, such as turbo modes, heads-up games and fun modes. CD Poker offer a software package which is regarded to be one of the best in the industry. The graphics are appealing, bright and very clear. In fact, it could very well be the most good-looking graphical 2D table and lobby of all online rooms. But there’s more under the shell. A lot of functionality is built in and you can change the visuals and miscellaneous settings to make your client act like you want it to. Player notes are supported, buddy lists as well, but first and foremost, a very nice hand history playback feature. The only disability would be the way you sort rooms in terms of stakes, but taking that aside, this is a solid package. 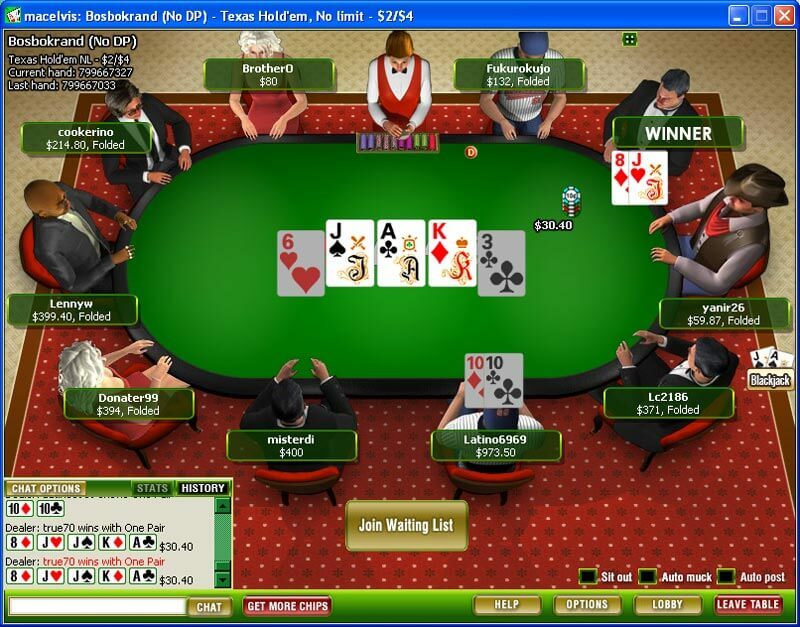 As with most other online poker rooms, you will find Texas Hold’em players at most tables, and CD Poker is no exception. More than 3500 players are connected during peak hours. Unfortunately, it can become difficult to find your table at medium and high stakes if you play. The tournament traffic varies between 2000 and 2500 simultaneously connected players. Here you can play sit ‘N’ go satellites, heads-ups and all the jackpot games at stakes going from low dollar games to beyond $100. Regular, scheduled tournaments are also very populated. CD Poker offer Texas Hold’em, Omaha and Omaha Hi/Lo. Fortunately, there is also a turbo mode, heads-up games as well as a special fun mode game. Texas Hold’em and Omaha only is not very common, which is why this room scores only a few points here. The players at CD Poker are usually not very good. Quite a few soft gamblers will be found here, but as always, you will face some considerable competition at high stake tables. Low and medium stakes are always filled with soft opponents and flop views of 60% are common. As a new player coming from EveryPoker.com, you are immediately eligible to a top bonus of 150% up to $600 plus an instant free $20 bonus and a free ticket to the $10,000 VIP freeroll which is held on the 27th each month by using our CD Poker coupon code. This instant bonus is paid out after your first deposit. To clear the bonus you must accumulate 1200 CD Points per $10. This is done fairly easy. You get one CD Point per $0.25/$0.50 game you’re involved in, ranging up to 7 points per hand if you play at stakes $1.5/$3 or higher. In addition, you have 90 days to claim this bonus, which is enough for anyone who plays a few times a week. CD Points are offered to loyal members. It is based on the rake which you generate, and we recommend that you play at stakes of $0.5/$1 or more to take care of the special offers. CD Points can be used for special VIP freerolls as well as reload bonus offers. These work just like sign up bonuses. A big bunch of promotions are available at CD Poker. Besides all the regular sign up bonuses and whatnot, you can participate in a bunch of World Poker Tour satellites, Jackpot Sit ‘N’ Go Champion of the Champions tournaments, $100 beginner’s freerolls, Fort Knox $100,000 Sit ‘N’ Go Jackpots, and a big bunch of other Jackpot games. Additionally, regular freerolls range from $1500 to $2000. Last but not least, there are three tournaments with guaranteed cash prizes at $10,000, $15,000 and $25,000. CD Poker offer exactly what you would expect from a high quality online poker room. There’s a 24/7 telephone support, e-mail with fast response times and a live chat. The replies are good and informative. Deposits: Credit Card, Click2Pay, FirePay, NETeller, OnDemandFunds, Moneybookers, Citadel, Wire Transfer, INSTADEBIT, CentralCoin, EcoCard, Bank Draft, UseMyBank, PaySafeCard and ewalletXpress.